Truthfully, I’m not much of a tofu eater. Aside from a few Korean dishes I grew up with, I wasn’t much of a fan. It’s pretty much a blah, flavorless protein, and I was equally blah, agnostic about it. But I guess it would be more accurate to say that I WASN’T much of a fan. Because I’ve been going crazy about tofu lately. More specifically, Seared Tofu with Soy-Maple Sauce. As previously mentioned, we’ve kicked up our clean-eating efforts due to my husband’s condition. I won’t rehash it, mostly because that post has been bombarded with health-related spams. And I don’t want the same fate for this post. I HATE spammers! But he is progressing quite well. 🙂 I will post the specifics of our program in a couple of months if this progress continues. Anyhow, we had to cut down our red meat and poultry consumption as a part of this effort. This meant increased dependence on other proteins. Consequently, we are now eating more tofu, as well as other plant-based proteins. 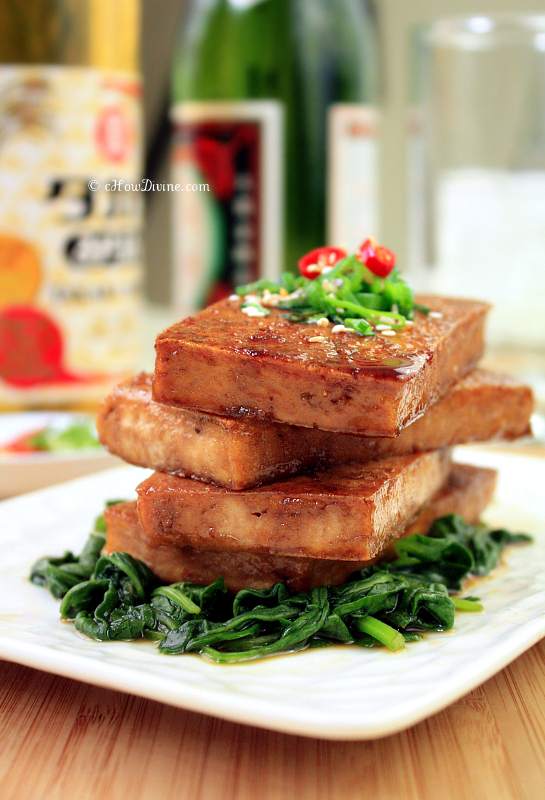 This particular tofu dish, which is my husband’s favorite tofu dish, is made with one of my most oft-used sauces. I use this sauce with meat, poultry, fish, vegetables, and even eggs! If I want to use this as a dipping sauce or a glaze, I usually simmer it separately to thicken it. But for tofu, I just cook it right in the pan along with the tofu. It is so darn easy to make. And you can use any excess sauce for steamed or sautéed vegetables. That’s what I did this week. I served the tofu on a bed of water-sautéed spinach and drizzled the excess sauce right over the tofu. It was so yummy, and I didn’t have to use a separate sauce for the spinach. It was absolutely perfect. *Please see Cook’s Note Below for substitution suggestions. Stir together maple syrup, mirin, sake, water, vinegar, and tamari in a bowl and mix well. Slice the tofu into thick rectangular pieces. Dab with paper towel to remove excess water. Heat a pan over medium-high heat. Add oil to coat the bottom of the pan. Lightly salt the tofu on each side. Sear the tofu on both sides. Once seared, LOWER the heat. Pour the sauce from step 1 over the tofu. Toss (flip) the tofu a few times to ensure that each piece is well coated. Once the sauce foams and becomes thicker, remove from heat. Plate the tofu and pour the excess sauce from the pan over the tofu. Garnish with chopped scallions and toasted sesame seeds if desired. If you are trying to lower your sodium intake, use low-sodium tamari (soy sauce). I used low-sodium tamari for this recipe. It was plenty flavorful for my palate. If you don’t have maple syrup, you can use honey instead. If you don’t have rice vinegar, you can use balsamic vinegar instead. Balsamic is surprisingly good when mixed with tamari (soy sauce). If you don’t have Asian rice wine, you can use soju or dry (pale) sherry. Additionally, if you are cooking for kids, you can substitute the alcohol with a broth or stock. But if you decide to use broth instead of alcohol, try using balsamic vinegar in place of rice vinegar. You can experiment, but I preferred balsamic with the broth-based sauce. Please keep in mind that if you don’t use mirin, the resulting sauce might be a bit runnier. This is due to the sugar that is in mirin, which helps to thicken the sauce. Keep in mind that your sauce will get a bit thicker as it cools. So remove the pan from heat when it is slightly runnier than you’d like. Additionally, you can add a small splash of water if the sauce gets too thick. Your sauce will get thicker the longer you simmer. As stated above, you can use the sauce as a glaze or a dipping sauce. Just heat the sauce ingredients separately in a saucepan until it thickens to your liking. If you like lots of sauce on your food, make more!!! Honestly tofu has never much crossed my way, so I never dared to buy it in the first place because I don’t know how to use it. Otherwise I am daring but not with that. As you said it, it can be blah, and I agree. ^.^ Anyhow I don’t mind trying your recipe, it sounds quite exciting and easy and I need easy fast delicious recipes. I am sorry about your husband, hope his condition gets better Gomo. Thank you Helene! I’ve never been a fan of tofu, but this dish really changed my mind. It’s surprisingly flavorful. The “skin” that is created from searing really absorbs a lot of flavor from the sauce. My husband is doing well. It’s only a skin irritation for him. So it’s not too bad. I hoping that will go away soon. Keeping our fingers crossed. Hope you are well! I hate spammers too, so I am moderating comments now because it was crazy at one point. Your seared tofu sounds delicious, and I love that you added maple. I hope your hubby gets even healthier. Thank you for sharing, Gomo and have a great weekend! That’s why I’m always careful about the words I choose. They really crawl the web to target their prey. The sauce that is used for this dish is one of my favorites. I use it all the time for so many different things. I love the maple in it too. As always, thank you for your kind words. A great weekend to you too! I am glad I came across your photo because it makes even tofu look delish. Trying as well to eat healthier, we love a plant-based chicken substitute product that is made by Beyond Meat. It’s hard to be creative with it sometimes, so when I see a tofu recipe, I will swap it out with their product. Can’t wait to try this one because the sauce sounds so yummy! Thank you so much Coleen! We haven’t completely cut out all meats, but we are eating vegan about 90% of the time. 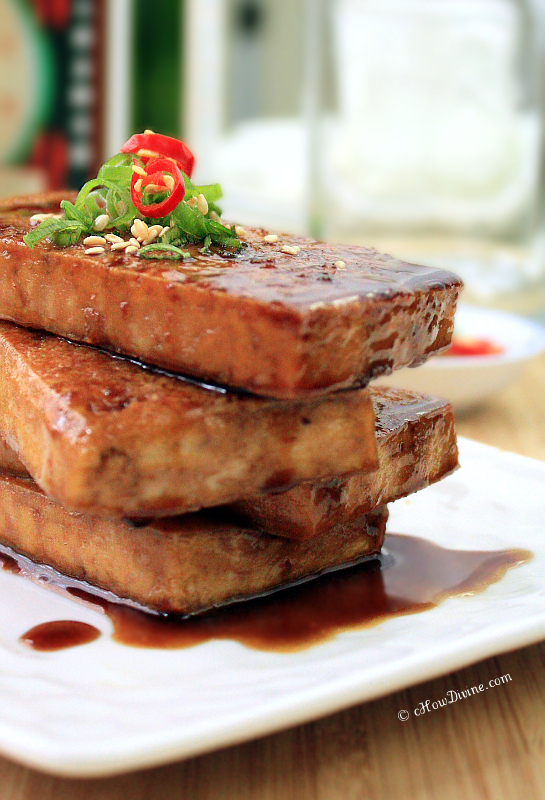 This is our favorite tofu dish. I hope you enjoy it as much as we do. Happy Saturday! This is a nice, simple dish. I do eat tofu sometimes, but it really does lack flavor – so whatever sauce you serve with it is key. This one looks terrific! Love the combo of flavors, and you’re so right that balsamic vinegar and soy sauce (or tamari) really are a good match. So glad you agree. Someone once told me that mixing soy sauce with balsamic vinegar was blasphemous. :D But they go so well together. 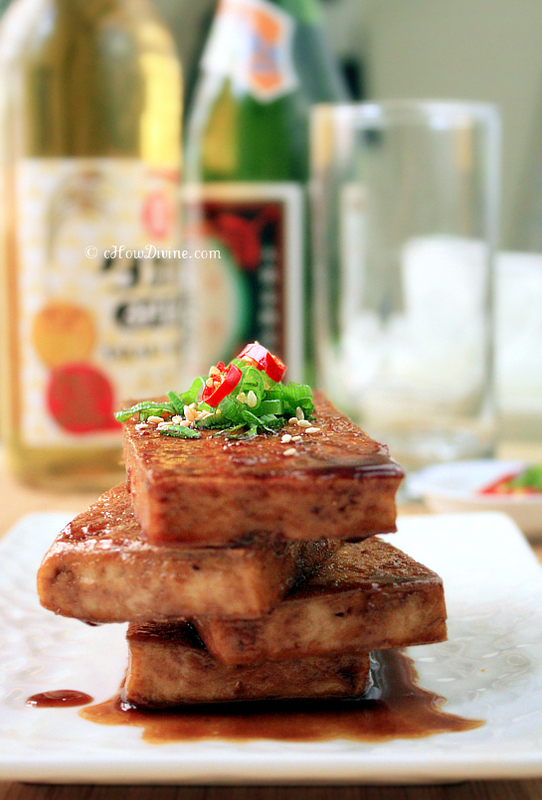 I hope you give tofu chance and give this a try. :) It’s very flavorful. Hope you have a lovely weekend! You are such a sweet wife. Hubby is lucky to have you making all these yummy stuff that accommodates his diet. I love tofu too. And it’s one of my fav doshirak foods. Can you believe I started packing my lunch to work (when I am surrounded by food)?! I need to munch or I feel like dying lol. We don’t eat til the end of service so…by then if I haven’t eaten, I be dying! BTW I tried adding the avocados to the bibimbap (like in your previous recipe), and I don’t know how I ever did without lol. Made me want to add some raw fish and turn it into hwedupbap. Isn’t it yummy?! Avocados are so creamy & so tasty with gochujang. I haven’t had hwedupbap since it got hotter. I’m craving it like crazy. I grew up with a mom & grandmother who told me not to have raw fish in the summer. So it kind of stuck! I’m waiting for weather to turn a bit before I do a face-plant in a chirashi bowl! A number of these spams are written in a way that bypasses my spam filter; but to the filter’s credit, most are caught. :) My husband’s doing fine. It’s a minor irritation if anything, but an irritation nonetheless. Much to his surprise tho, I think he is enjoying these vegan dishes more than he thought he would. He actually asks for them even when I’m willing to let it slide. I hope you try the sauce. it’s really flavorful. But it’s not really acidic. If you want it a little more acidic, just add a TB instead of 2 tsp of vinegar. Hope you are well MJ! Thank you for your kind words. This dish is great for those who aren’t really enamored with tofu. It has a wonderful flavor that even meat-eater’s can appreciate. Let me know how it turns out if you ever decide to give it a try. Hope you’re having a wonderful week! Hi! Making the tofu now, do you add the water and rice vinegar to the bowl and mix it together with the other wet ingredients? Yes. Mix all of the ingredients together. The change has been reflected. Thanks Julie!